The start of summer vacation calls for a trip abroad, specifically, across the pond. Hence why I just returned from an incredible trip across the globe to London. 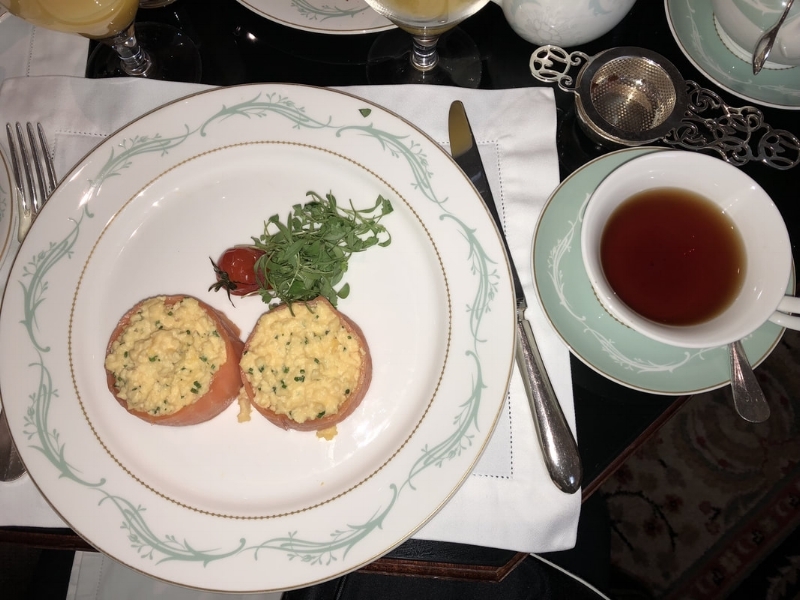 During my four-day stay in the city, I indulged in delicious afternoon teas, shopped at some of the most popular stores, took a dance class, and snapped a bunch of pictures for my social media and blog along the way. Let’s start at the very beginning of the trip. 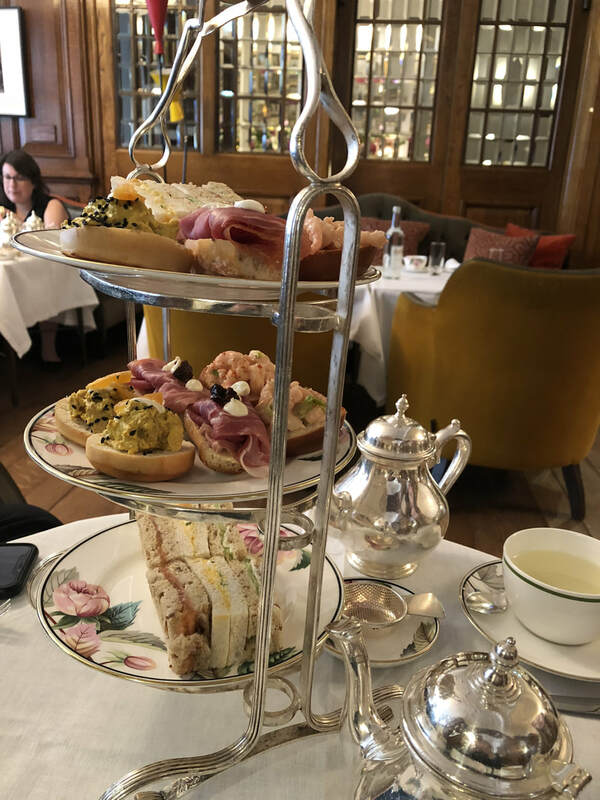 As soon as we got off the Eurostar—a high-speed railway service that carried my family and me from Paris to London at 186 mph—we hopped in a taxi to go to our hotel, The Savoy on The Strand. I even got to ride backwards in the cab (where the driver drives on the opposite side...totally weird)! After checking in to our room on the private floor of the hotel, my family and I headed straight to Élan Cafe, a Vegetarian-friendly eatery adorned with dozens of pastel pink flowers. They offer a variety of classic English treats such as strawberry caneles, fruit tarts, extra-large macaroons, and hazelnut paris brests. Next I headed to one of the most famous spots in London: Covent Garden, or as I like to call it, “a shopper’s utopia.” The space is filled with clothing stores such as Burberry and Ted Baker, multiple beauty pop-ups like MAC and Smashbox, and places to grab a bite (renowned macaroon shop Ladureé was a popular spot). I stopped in Clinique for a mini facial so that I could feel refreshed after the 2½ hour train ride. In a food coma, I hopped in the car and headed toward Wembley Stadium to watch a familiar face from the U.S. perform in concert: Taylor Swift! After Charli XCX and Camila Cabello (her opening acts) sang, Swift slayed the stage as she belted out the entirety of her new Reputation album and some of her older hits, of course. As I shouted out every word to “Ready For It” I couldn’t help but get fired up about what other exciting things could be in store for my trip. The next day, I returned to Covent Garden to take photos in front of beautiful flower displays that have been a part of its history since 1630. Although, I regret to inform you that Eliza Doolittle was not on the street corner selling her posies. Bummer. After snapping a bunch of pics, I headed to Pineapple Dance Studios to take a commercial street (aka hip-hop) class from one of the most popular choreographers in London. I had an absolute blast grooving to her choreography, which was to the popular anthem “This is Me” from The Greatest Showman. My mom and I then headed to Balthazar to indulge in French cuisine. I ordered one of my fave dishes, a tuna niçoise salad with hard boiled egg and tomato mixed in. Absolute heaven. After that, my family and I took a cab to the Coca-Cola London Eye to ride on the popular tourist attraction. The view from the top was absolutely beautiful, however, I was disappointed to find that Big Ben was under construction and completely covered in scaffolding. After the meal, we headed to see Hamilton at the Victoria Palace Theatre. The production centers around 17th Century Founding Father Alexander Hamilton, and his desperation to ensure his own legacy. I admit I’ve seen the show five times already, but I just couldn’t miss out on the opportunity to watch it in another country. The acting was absolutely extraordinary and all actors had beautiful voices (with British twangs to them!) that filled the 1,550–seat theatre. However, no cast can ever hold a candle to the original group that performed the show in New York. The following morning, I headed straight to renowned restaurant Sketch to take pictures in their world-famous bathroom. Yep, you heard me right. Their egg-shaped toilets and multicolored mosaic ceiling look like they’re straight out of outer space. Inside the cubicles themselves, haunting tunes and futuristic noises play while you use “the loo” under changing LED lighting. Who would have ever thought?! Next, I visited Saint Aymes, a cozy cafe with a stunning lilac flower display outside it and floral-lined walls on the interior. The cuisine captured the peaceful aura of the shop’s outdoor scenery: beautiful pastries such as fairy cakes (aka cupcakes) with pastel swirls, hand-painted chocolates and even a rainbow-layered cake. Not to mention, they serve 23K gold chocolate, fit for a true royal. Speaking of royalty, I suddenly felt inspired to visit Buckingham Palace that afternoon. I took pictures in front of the intricate gold gates and watched as the guards stationed inside remained completely straight-faced. Seriously, though, do they ever smile? 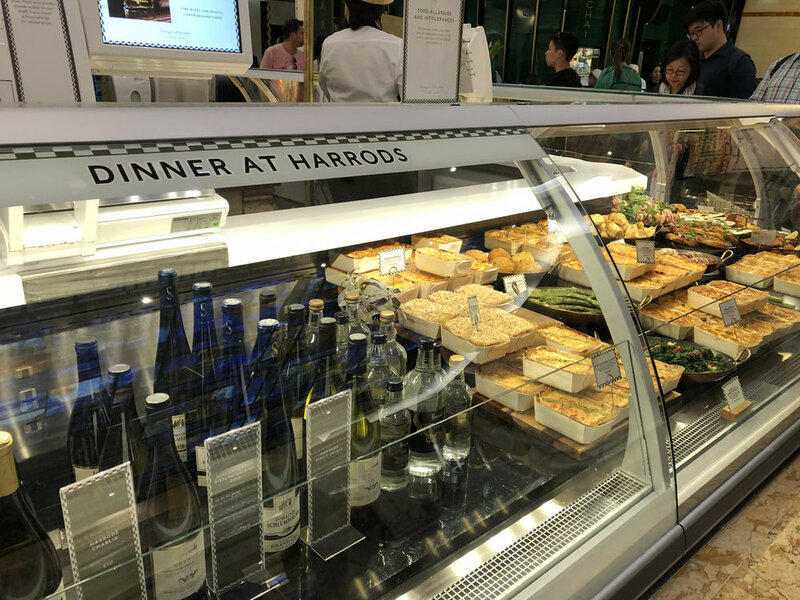 After that, I headed to Harrods for a midday shopping detox. I was in awe of the variety of designer dresses, jackets, tees, and more. A pink lace dress from Self Portrait particularly stood out to me, since pastel pink is my fave hue (hence my blog’s color scheme). 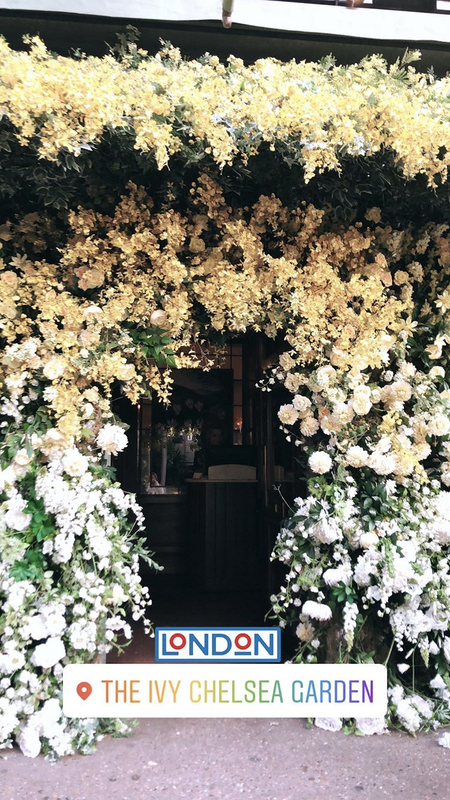 After a quick dip in the pool at our hotel, we went to dinner at the Ivy Market Chelsea Garden, which had a beautiful display of white and yellow flowers outside, crafted by fashion designer Jenny Packham. For my main course, I enjoyed the Atlantic sea scallops with pea purée, lemon zest, sea cress, and crispy shallots, along with a side of baked sweet potato. Everything tasted delicious, except the restaurant was quite busy and it took a very long time for all the food to arrive. For my last morning in London, I had a delicious breakfast at the restaurant in my hotel’s lobby: Kaspar’s. They made scrumptious scrambled eggs with smoked salmon (served sushi style!) with a side of wheat toast. A protein-packed meal was the ideal way to start off my day! Then I went to interview Juliet Angus—one of the stars of Bravo TV’s Ladies of London—at Harry’s Dolce Vita. I am in love with her blog and killer sense of style, so I really enjoyed getting to know her better. 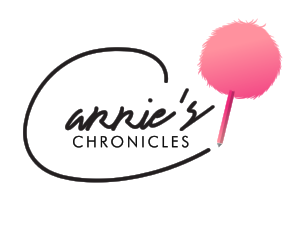 Stay tuned for her article, to be published on Carrie’s Q&A soon! After taking another commercial class at Pineapple Dance Studios and doing more shopping, it was already time for dinner. My family and I went to Queen’s Head Pub prior to seeing another show: Strictly Ballroom, about a dancing pro and a beginner who decide to compete in a championship competition together. I admit that it had quite a few cheesy moments that threw me off, and an actor forgot his line at one point, but the dancing was sensational and I generally enjoyed the production. Riding to the airport the following morning, I watched London zoom by me for the last time. But as I unpacked my leftover European change in New York that night, I realized that my sadness in leaving this city was unjustified. I will definitely be back to relive the British magic very soon.